He’s a “Tall” cool one. You know him as the voice behind Afrojack‘s current chart hit, “Ten Feet Tall”, and perhaps you just saw him performing during Good Morning America’s Summer Concert Series. He’s a talented pianist and vocalist and an all-around nice guy; at least, according to his Twitter description he is, but I can definitely confirm that. 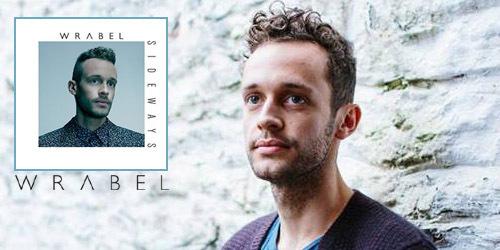 His featured spot has propelled him into the national spotlight, but as far as a budding solo career, he’s ready, willing and Wrabel. Born Stephen Wrabel, the performer who bills himself by just his last name currently records for Island Records (radio via Republic Records) and this past Tuesday, his EP titled Sideways became available. The four song effort features a solo cut of “Ten” as his voice smoothly glides along with the piano, absolutely worthy of some AC and Hot AC play. (Hope his label is taking notes!) The effortlessly beautiful “Sideways” starts on a calm stride before packing a pop punch, while the smooth “Give It Time” and wildly impressive “Into The Wild” make for a great listening experience in a mid-90’s piano pop meets modern-day production set. It’s certainly a nice introduction before his eventual full-length album is issued. Between all his plane flights and performances this week, Wrabel graciously took a few moments out of his release week schedule to answer some questions about his new EP, songwriting, the charts and more for a PGTC interview. Enjoy! PGTC: Thanks for taking the time to do this! How exciting is it to finally have an EP of music out there ready for people to listen to? SW: absolutely! thank you. ah i can’t even express how glad i am to have some music out there. it’s a crazy feeling seeing my face next to some of my favorite artists on the “new releases” section of iTunes. i guess we picked a good week to release! haa. quite intimidating, but also just so crazy. hard to believe, really. PGTC: I really enjoy “Into The Wild” and (EP title track) “Sideaways”, but there are some great melodies and fantastic vocal performances. It captures the best of both worlds, a straightforward piano-driven pop sound and a more experimental nature. What was it like crafting this batch of songs and is there one in particular that’s your favorite? SW: well thanks! it was an…interesting process. the EP has been a long time coming for me. i’ve been writing and writing and really just searching for those moments of magic. i’ve found while writing that you sometimes encounter some sort of unexplainable…something…that comes out to play. you can’t force it and you have to just run like hell after it as it comes. i was given such an incredible opportunity to travel so much making the record — something that has impacted the sounds and emotions in a big, big way. you mentioned “into the wild” — a song i wrote with one of my favorite artists actually, dan black, and one of the best guys i know (and most talented…) drew pearson, in dan’s studio in paris. it came after a long day of work on another song that seemed to be stuck. “sideways” was a very special day with jim eliot and dan mcdougall, both of whom also co-wrote “give it time” with me. hmm. a favorite, i’m not sure i can say. it was important to me that every song selected for the EP (and the upcoming full length) be something special. i think i can say that? haa. i consider every song a sort of snapshot…maybe like a scene in a movie. something that is this one moment here and now. this is what i’m feeling. this is what i’m thinking. this is what i wish i could say, but just can’t seem to get out right. insert the BIGGEST thanks to all of my collaborators here. without them, there is nothing. did i ramble? i tend to ramble. PGTC: The success of “Ten Feet Tall” has been amazing to watch, both in your solo version and with Afrojack’s remix. When you originally wrote the song a few years ago, did you expect it to connect with as many people as it has? SW: short answer: no. long answer: nooooo. haa. “ten feet tall” has been a special one for me since about halfway through the day chris braide and i wrote it. i could just feel it. he could too. it’s so rare to feel that. but so, so fun. i came in that day and he was just playing the opening piano theme and i sat down, pressed record, and started singing. it was one of the only times i’ve come into a session with a title. i had “ten feet tall” all in my brain. what could it mean? how could we say it? what does it sound like? it was a little over two years later that nick (afrojack) heard it at the universal building. he told me later on something like “this is how i heard it” — referring to what is now his first US single from his new record. nick is so gifted. brilliant, really, at capturing the emotion of a song and just playing it up and up and up and up. that song is a permagrin for me now, and it’s been so rewarding to see people’s reactions to it. to see that many people dancing, smiling, singing along…it’s unreal. i’ve even gotten a few messages on facebook // twitter from people that are using “ten feet tall” in their weddings. i cry. i just cry. haa. PGTC: A number of outlets have picked up on “Ten”. I myself saw a clip of the video riding in a taxi in New York City a few weeks back. However, the journey of this song got a major boost in February when it was featured in Bud Light’s Super Bowl ad. What did you think when you first heard about the plan and how was it for you actually seeing it come to life? SW: i think my first words to my manager were something like, “HOLY SH*T. WAIT WHEN IS THE SUPER BOWL?” … i just didn’t know. i don’t do football, really. ok let’s move on. i couldn’t believe it. the super bowl? THE SUPER BOWL? it’s just crazy. that’s just what it is. and re: the new york cab bit — i plan on hiring taxis until i find one with it playing. hehe. i mean c’mon. that is nuts. “ten feet tall” in a taxi?? PGTC: I imagine that since “Ten” is ranking on several airplay surveys here, along with international lists, that you’re checking some of them out. How avid of a chart watcher are you with both your own releases and songs that you’ve written for others? PGTC: Since the World Cup is still going on, are you partial to any sport in particular or is music still your favorite workout? SW: let’s go with the latter… i had some friends over to watch a world cup game and ended up leaving to go to a bookstore about twenty minutes in. playing the piano can burn around 171 calories an hour. that’s about all the sport i need. PGTC: Final question – everybody’s waiting on whatever could be the next “surprise album” to be released. Who do you think could do it next and would you ever entertain the idea? SW: why not beyoncé again? she nailed it the first time. it was such a fun feeling to wake up to a new beyoncé album // whole set of videos. i’d like to have that feeling again someday. if you guys see her, let her know. green light. hmm i’m not sure i would // not sure i wouldn’t. i’m pretty up for whatever — any way to get music out there and keep things interesting. Thanks again to the music man himself for some great answers and be sure to check out the new tunes and his ongoing adventures by clicking the links below.